Superman goes "Dark Knight" dreary (and frankly looks a little pale) in his latest not-so-super reboot. Also, note the shameless product placement in this publicity still. © 2013 Warner Bros. Gritty, gray and grim from the moment it leaves Krypton, the meandering and morose "Man of Steel" has more in common with Christopher Nolan's joyless "Dark Knight" trilogy than with any previous Superman incarnation. You'll believe a man can fly, but this one never truly soars. Nolan, who directed those three Batman blockbusters, serves as a very vision-defining producer here. He even brought along his Batman trilogy co-writer David S. Goyer and score composer Hans Zimmer. Although Zack Snyder (whose previous comics-to-movies credits include "300" and "Watchmen") is credited as director on "Man of Steel," he never strays from Nolan's gloomily downbeat template once Superman arrives on Earth. 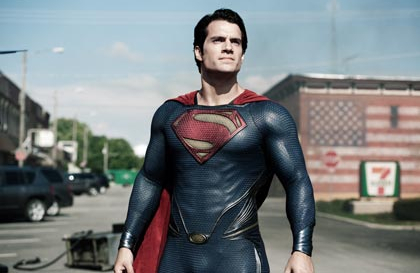 While the filmmakers deserve credit for attempting such a bold break from the character's cinematic past (which includes four inconsistent tongue-in-cheek Christopher Reeve flicks, and "X-Men" director Bryan Singer's disastrously misguided 2006 "Superman Returns"), going dark and dismal simply doesn't suit Superman. Moping and operating from the shadows is fine for Gotham City's slightly psychotic protector, but nobody wants to see super-powered Clark Kent hiding out as a bearded loner transient, refusing to give a deserving jerk his comeuppance and generally acting pity-party pathetic. When he finally gets into costume, even his outfit's iconic primary colors are muted to dull respectability. We first see the adult Clark (a fittingly handsome and hero-jawed Henry Cavill) toiling as a far-north fisherman and later bussing tables at a restaurant, apparently not staying anywhere very long after doing inhumanly impressive but anonymous good deeds. An incredible coincidence puts him near a long-hidden spaceship from his home planet Krypton, where he learns his back story and gets The Suit. The ship also apparently provides Clark with a generous supply of pancake makeup and high-gloss mousse. Whenever he appears in costume, his pallor turns zombie pale while his hair becomes shinier, blacker and more rigidly styled. Unexpectedly, "Man of Steel"'s most enjoyable segment turns out to be its imaginative retelling of Superman's famous origin. That familiar "newborn rocketed to Earth" tale is given an elaborate fantasy makeover that includes flying dragons and an underwater fetus grove. Russell Crowe is sly and defiant as new father Jor-El, who clashes with ferocious rebel General Zod (Michael Shannon) over the best way to preserve their doomed planet's legacy. Like Marlon Brando's Jor-El in 1978's "Superman," Crowe's Jor-El later appears to his son Kal-El (aka Clark Kent) as a virtual ghost in the machine. Although technically deceased, Jor-El may be the most dynamic and interesting member of the cast. His only begotten son who was sent to provide hope and salvation to mankind faces his greatest trial at age 33, just in case all of the movie's other Christian parallels aren't obvious. That's when vengeful General Zod locates Kal-El and begins wreaking monumental havoc to take him prisoner. A basic problem with the plot is that General Zod and his evil Kryptonian shipmates are exactly as super as Superman on Earth. Because that means all of them can move faster than a speeding bullet, all of their battles should be short-lived blurs. For the same super-speed reason, what is supposed to be an emotionally devastating scene in which Clark's foster father Jonathan Kent (Kevin Costner) meets his demise makes absolutely no sense. Also, the movie makes a dramatic change to Superman's nature that will seem familiar to SF fans acquainted with the Harlan Ellison "Outer Limits" episode "Demon With a Glass Hand." Putting the weight of his world on the character in that way burdens him with one more excuse to be miserable, which is the last thing the character needs. Daily Planet reporter Lois Lane (Amy Adams) gets an empowerment upgrade that makes her more than a mere damsel in distress (although she serves that function as well). Lois doesn't have much chemistry with either Clark or Superman, acting more like a concerned associate than a potential love interest. Then again, Cavill is so blankly stoic in both roles that it's hard to imagine him warming up to anyone. That's also why an out-of-character laugh-line zinger he has to deliver in the last act seems inappropriate. Laurence Fishburne is an ear-stud-wearing version of Daily Planet editor Perry White, whose main concern when skyscrapers start falling is rescuing an attractive underling named Jenny (Rebecca Buller). Those scenes feel so detached from the rest of the action that they seem to be taking place in a different movie. Upping the ante from last year's battle of New York in "The Avengers," the climactic Metropolis showdown in "Man of Steel" is a horrific building-toppling free-for-all that would encompass thousands (if not tens of thousands) of likely fatalities. Where the urban destruction in "The Avengers" somehow managed to remain a comic-bookish catastrophe, the devastation in "Man of Steel" resembles a grotesquely extended 9/11 urban nightmare. That sums up the main thing wrong with "Man of Steel." The movie is difficult to enjoy as an escapist superhero adventure because it tries so hard to stay rooted in a dismal no-fun reality. At the same time, its premise is too ridiculous to hold up under its inherent absurdities and logic flaws. Where "The Avengers" embraced its colorfully bizarre outrageousness, the stodgy "Man of Steel" is so determined to distinguish itself from its funny-book origins that it even keeps the character's name out of the movie's title, a la "The Dark Knight." The word "Superman" is uttered only twice in the nearly two-and-a-half-hour running time, and that includes a scene in which Lois is cut off the first time she tries to utter it. Like Nolan's cold and resolutely humorless Batman trilogy, "Man of Steel" tries so desperately to be taken seriously that it sacrifices nearly all of its character's endearing comic-book charm.